The team behind Codemasters' ONRUSH were also the team behind the excellent MotorStorm games on the PS3, a series of straightforward rough and tumble racers. 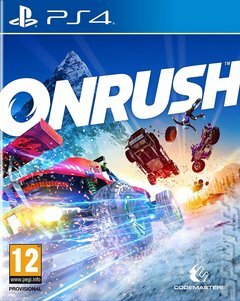 At a glance, ONRUSH looks like it's providing much the same sort of game for the current generation of games systems, but if you look a little more closely you'll realise that Codies has taken that kind of fun, fast, arcade-style racing and built something brand new on top of it. You see, it wouldn't be unfair to describe ONRUSH as Overwatch in vehicles. You race in teams, with different classes of vehicles offering different passive perks, active abilities and an ultimate skill that might make or break the whole match. There are different sorts of game modes in the mix, but at its core this is combative, team-based racing. The result is fast, furious and visceral, but it's also surprisingly layered and strategic. As things start out you'll feel like you're in a tumble dryer full of cars, but as you start to understand how each vehicle works you'll figure out how to use it to your ability, picking off enemies and protecting your teammates, all at breakneck pace. ONRUSH is big, bold and sure to leave your thumbs aching as you try to keep up.